Because it was in London, where I live, a place I love. So the issues we discussed in the first Olympukes are even more keenly felt by us because it affects us so directly. 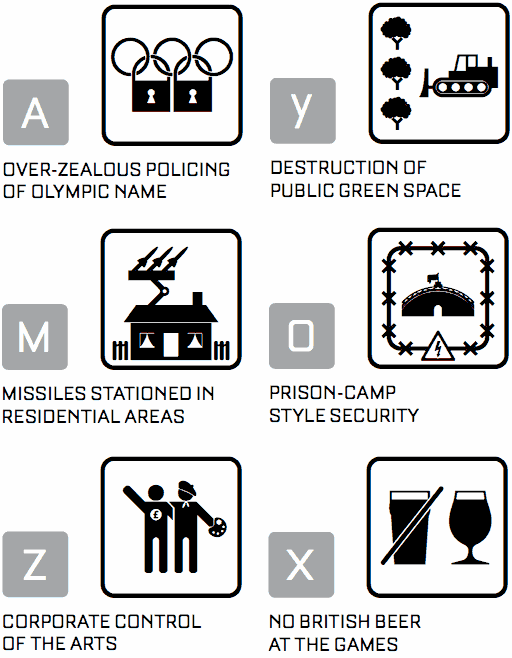 There are so many issues surrounding the Olympics – about what has happened to the communities where the games are being held, the draconian restrictions because of every atom of it has been defined by sponsorship, and as a graphic designer the missed chance of the logo and the ignoring of the wealth of talent in graphic design for commissions such as the Olympic posters. The original idea of Olympukes was prompted by the almost religious treatment of the Olympic pictograms by designers. There was a time when it was one of the top jobs in design, where it was felt it could unify the human spirit. Now rather than being at the forefront of design in interpretation and concept it has become a cynical marketing exercise. I also think the idea of speaking to all nations a bit of a redundant concept. The world has fragmented; we now celebrate difference. Our idea of the pictogram as a transparent vehicle for communicating and idea also feels rather dated, the classic pictograms are loaded with western assumptions about the structure of society from the role gender to the material objects people own. This project clearly uses these to formulate an opinion which I think is a least more honest. Olympukes 2012 is free for non-commercial use from FontShop. There are no comments yet on "Olympukes 2012"